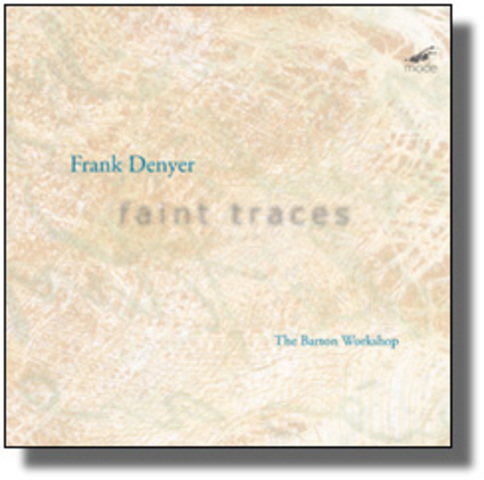 CD of six compositions by Denyer played by The Barton Workshop (Amsterdam): ‘Out of the Shattered Shadows 1’; ‘Out of the Shattered Shadows 2’; ‘Faint Traces’; ‘Music for Two Performers’; ‘Play’; ‘Passages’. Liner notes by Bob Gilmore. Like ‘Fired City’ (2002), this is a portrait CD and comprises première recordings of six works. The three longest – one of which is the title track (2001) – are the most recent. All six works continue Denyer’s research into new acoustic instrumental sources, specifically reeds and rattles. Several flutes, whistles and a large wooden box were made especially for the music. He also experimented with new performance techniques on strings, both plucked (retuned autoharp, banjo) and bowed (heavily muted violin). One of the pieces – ‘Out of the Shattered Shadows 2’ – marks the beginning of his interest in offstage musicians, an interest that has continued in more recent work; this led to a number of recording problems that had to be solved when putting the piece on CD. Denyer’s involvement in the CD was as composer, co-director of The Barton Workshop ensemble, conductor and vocalist. The disc was reviewed more widely than any of his previous CDs, in sources such as Paris Transatlantic Magazine (which also published an extended interview with him in June 2006 as an offshoot), The Wire, and elsewhere.